The two neophytes – winner & 1st runner-up in the Zack 2012 scholarship competition are Aaron Dimoff (bass baritone), and soprano Katy Clark. Both exhibited an obviously professional approach to their craft and neither showed any manifestations of temerity or nervousness. Miss Clark performed a Don Giovanni duet with the renowned baritone John Fanning (one of this writer’s favorites) and unexpectedly held her own! Her interpretation of Offenbach’s ‘Doll’s Song’ was enhanced by a high-wattage smile that made the aria even more fun than its usual mechanical dramatics. Dimoff’’s solo Méphistophélès demonstrated his awareness of the context as he sang the piece almost tongue-in-cheek. Mezzo Erin Lawson provided melodrama and histrionics to her reading of ‘Smanie Implacabili’ from Mozart’s Cosi Fan tutte. She displayed her range and control in rendering a faultless ‘Una voce poco fa’ from Barber of Seville (the real, not Looney Tunes version!) Verdi’s “Traviata” contributed three arias: – Kurt Lehmann’s emotional Alfredo telling of his joy with Violetta; then Fanning as Valmont père giving the audience a heartfelt ‘Di Provenza’ that seemed somewhat out of synch with the orchestral background. The Al fresco solo ending was a showpiece of his baritone rang, especially the challenging G below C. Then, Betty Waynne Allison gave an apogee rendering of the anthem-like ‘Sempre Libera’ wherein ‘the lady of the camellias’ gives us her philosophy of life. The lady manages to sing to every patron personally! ` This was a vivid and heartstring tugging moment that should have been the ending of part one. 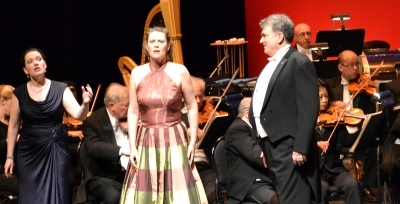 This writer felt somewhat sorry for Lehmann & Fanning having to follow such a highpoint with a Don Carlo duet! There is a moment in Offenbach’s Hoffmann where the baritone cons the soprano to continue her career in spite of it being a death sentence. Dr. Miracle conjures up her deceased mother as part of the scheme. Allison, Fanning and Lawson gave this trio aria a vibrant & dramatic impact. This year’s iteration might also be titled “PoperETTA+”. The inclusion of Lehar’s ‘Land des Lächelns’ is technically operetta! Lehmann aced the ‘Yours is my heart’ aria. The podium was shared by David Speers and assistant conductor Peter Oleskevich, celebrating his final year with O.H. before his planned move down East. Oleskevich gave us a light-hearted and lilting rendition of the Italian Girl in Algiers overture that afforded the oboes & flute solo opportunities to positively shine. POPERA+ will be at Theatre Aquarius on Thursday evening & Saturday matinee …certainly worth hearing.